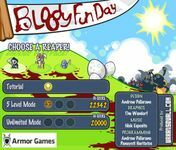 Bloody Fun Day is a puzzle Flash game developed by Urban Squall and published by Kongregate on March 12, 2009. Players control one of a family of three grim reapers and are tasked with moving around an island of hexagonal tiles, killing creatures called Cuties in order to replenish their own life force. Cuties come in four colors. Only the red ones restore life; the others charge special abilities that give the player more ways to kill further Cuties. Source: Wikipedia, "Bloody Fun Day", available under the CC-BY-SA License.